How to Eat Chocolate Guilt Free….. Some foods just scream shameful, indulgent, luscious, good eats. They look sinful; they taste decadent, and turn you from liking food into a full-fledged foodie. What if I told you that I took one of those foods, and made it healthy? Don’t go to another recipe! These little sweets taste just as luscious and amazing as any full sugar, full fat version, but you can eat them without the guilt, and possible shame, you may be left with when you are done. They are soft, chocolatey, melt in your mouth delicious, and only have four ingredients with two optional ingredients. Are you ready? These will blow your mind, Dark Chocolate Truffles. At this point you are probably speechless. Like my Date Breakfast Bites these are super simple, super healthy, refined sugar-free (if you use unsweetened coconut), and oh so amazing. 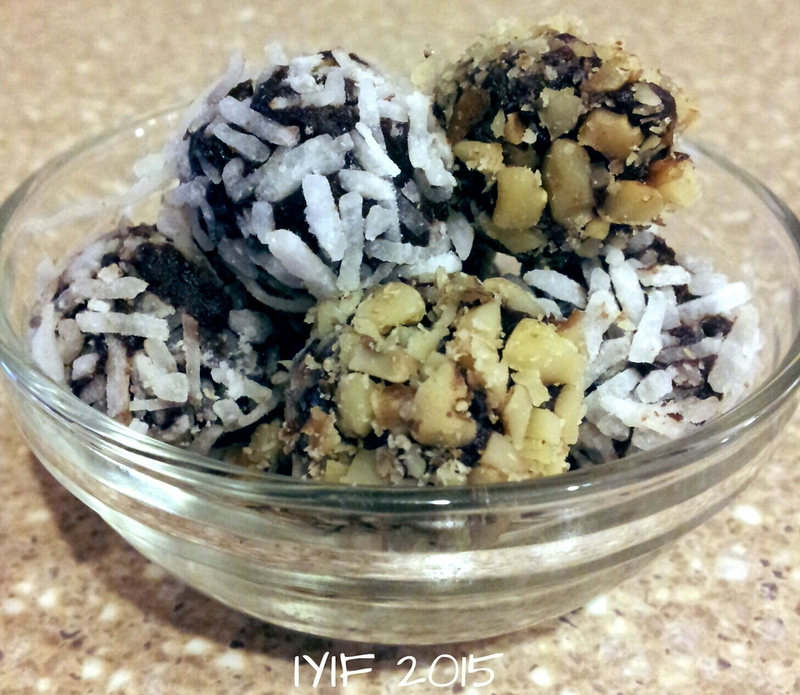 They only consist of Medjool dates, water, unsweetened cocoa powder, and Stevia. 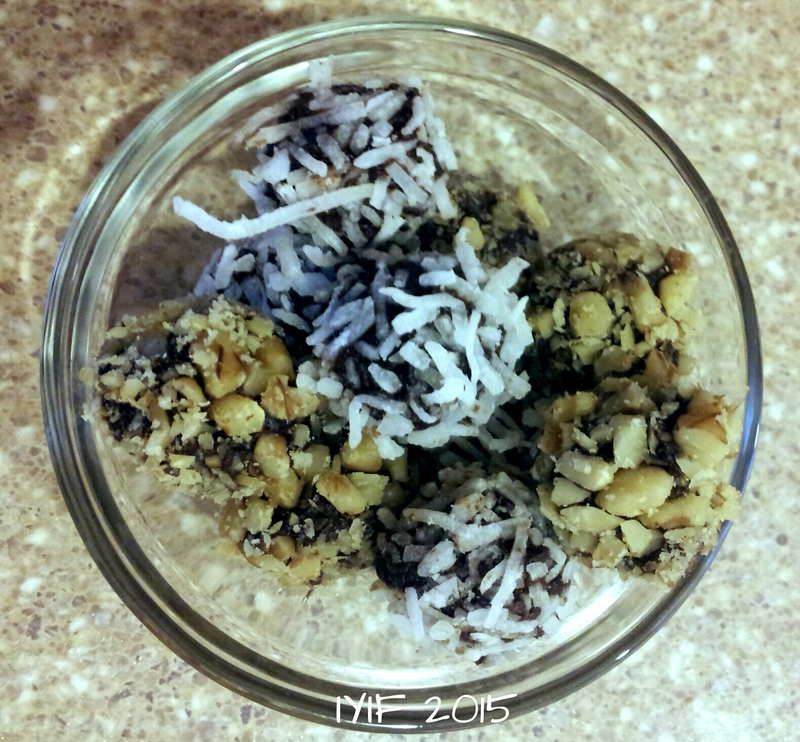 The two optional ingredients are shredded coconut and walnuts that I used to roll the truffles in. I had seen different versions of chocolate and dates over a period of time and was rather skeptical myself, but decided that I was going to see what I could come up with. And I was amazed at how the cocoa powder transformed the dates into something new. I know that the dates are super sweet on their own, but I wanted to take the edge off of the unsweetened cocoa and that is why I added the smallest bit of Stevia. These truffles are soft, and delicate, and they stay soft for days so they aren’t going to hold up under other cookies or candies if you layer a tray for someone, but they can hold up under their own weight. The process is quick and easy, probably less than 30 minutes from start to finish. 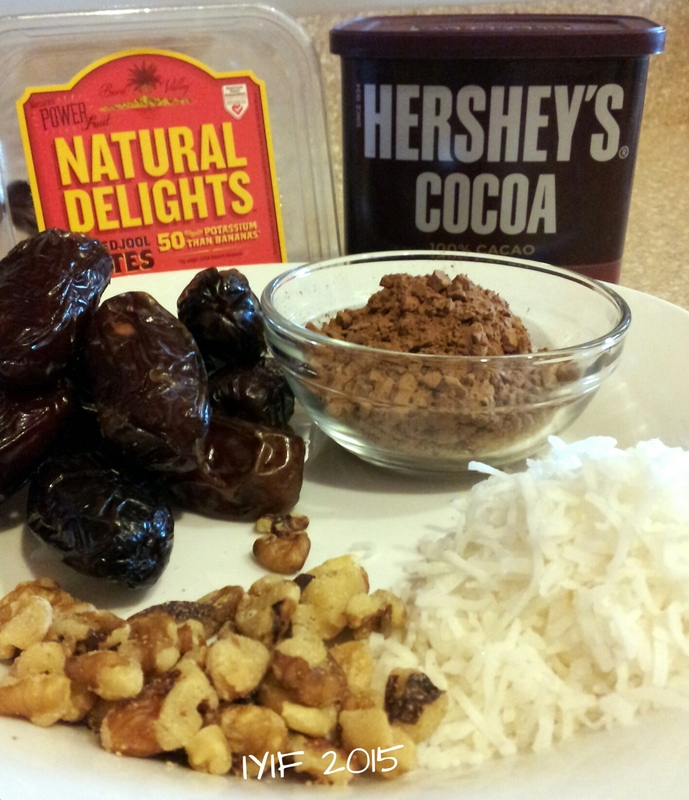 I pitted the dates and placed them in a small sauce pan with 3 Tablespoons of water, just enough to soften them. I wanted to get the process done quickly so I kept the burner on high, and broke the dates apart with a wooden spoon while they were simmering. As soon as the water was gone, less than 3 minutes, I removed the dates from the heat and finished mashing them into a paste. I stirred in the unsweetened cocoa, make sure it is sifted so you don’t have bitter chunks, and Stevia changing the dates into the appearance of chocolate frosting. 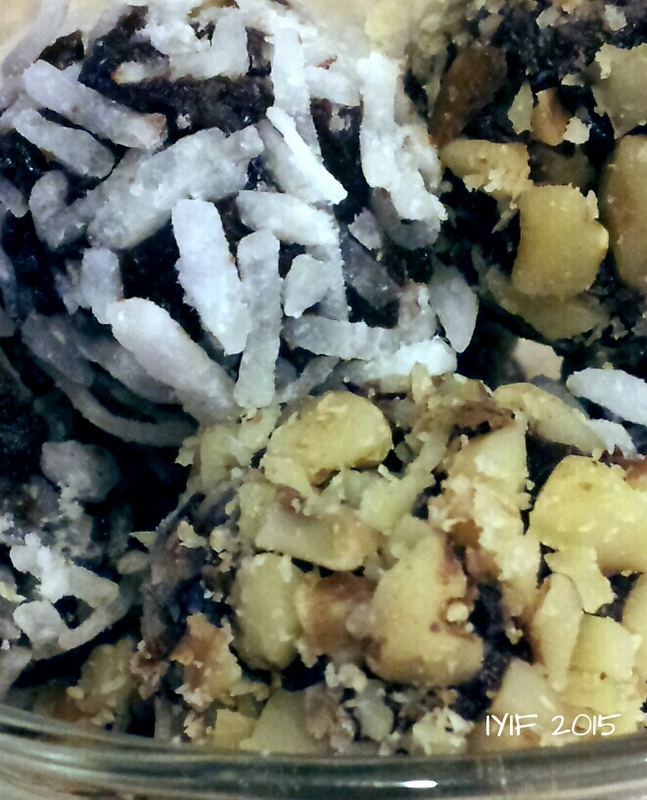 Using a measuring teaspoon I rolled tiny little balls in chopped walnuts, and some in shredded coconut. (I had sweetened coconut in the pantry, but you could make this recipe 100% clean if you just use shredded coconut.) 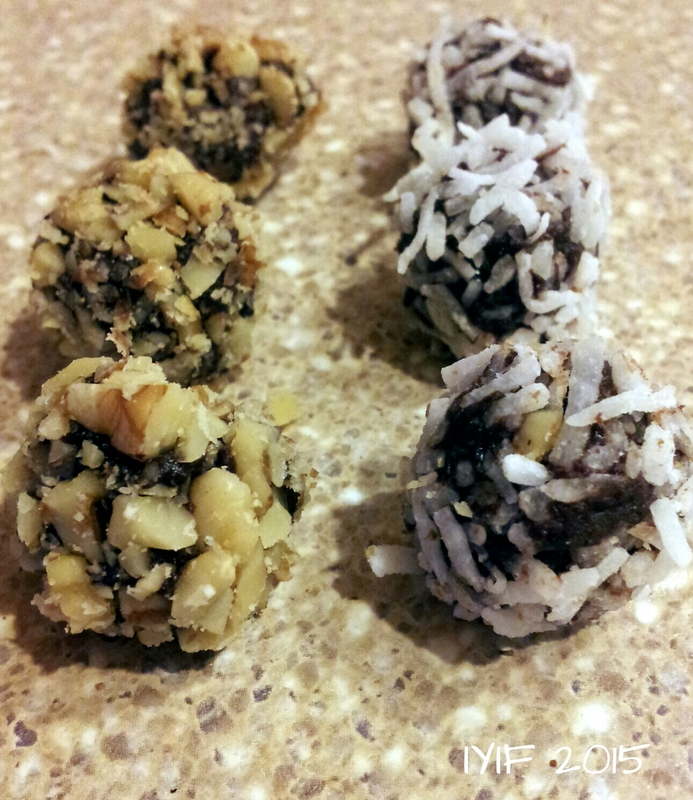 Each little truffle is 40 calories rolled in coconut, or 44 calories rolled in walnuts. If you wanted to do a bigger, bolder presentation you could make them in bigger sizes, but I found that they worked perfect in a small size because of how rich they are. Either way, they are a healthy snack you can feel good about, share with friend, or just keep for yourself. Either way, sit back, relax, and enjoy! Place on wax paper, store in a closed container when cool. I hated dates as a kid, but I guess tastes change. 🙂 With the chocolate you can’t even taste them. 🙂 Hope you enjoy!